The rain poured down on the campus as the students and families streamed into NPHS on Panther Preview Night, an opportunity for those interested in NPHS to find more information about the school facilities and programs. “In the past we have called it School Choice Night and did about a 45 minute presentation in the PAC for families that wanted a school choice. This year, we wanted to do a big information night for all of our families that are interested in finding all about the great things taking place in NPHS,” Stephen Lepire, principal, said. The night started off at 4:45 with a BBQ dinner provided by Cronies and school tours given by teacher and student volunteers. Then the families were gathered in the gym to hear a welcoming speech given by Lepire. At 6:15, families went to breakout sessions. These sessions covered a variety of topics, including information about academic programs, sports and school choice, a process students interested in NPHS must complete if they live in a different area, such as Thousand Oaks, Camarillo, or Westlake. More specifically, students and their families learned more about programs such as International Baccalaureate and DATA. Lepire and Carly Adams, assistant principal of activities, organized the event with the help from department chairs and program leaders. Teachers and staff did presentations on the area they supervise over. Program leaders such as John Sargent, choir director, organized performances to show off some student talent. Student volunteers such as ASG and student ambassadors also helped out with the event. Sarah Wang, junior and NPHS ambassador, helped familiarize families with the school. “I directed people to the classrooms they were trying to find and answered questions about daily school life, class sizes, and classes offered,” Wang said. The event offered several presentations on these classes and programs. Christy Hodson, English department chair, went over the English program and the different levels of classes, including CP and IB, available to students. Hodson also touched on related programs such as digital video production and broadcasting, creative writing and journalism. In addition to coordinating the choir performance, Sargent also provided information on the choral program to prospective students. Sargent discussed the benefits of participating in choir, including a rigorous program and a competitive edge in the college application process. Nick Guerin, chair of the career technical education department, offered information on pathways future students can take and the Majors program. Guerin discussed the DATA program and career specific courses such as woodshop. Such programs provide an opportunity for students to learn more about fields they are interested in. In another presentation, students and their families had the chance to learn about the language programs available to students from Seth Geher, Spanish teacher and chair of the world languages department. Languages offered include American Sign Language, French, Spanish and Chinese. Various levels are available within these programs, such as IB and CP courses. Furthermore, families were able to learn more about the NPHS athletic department. Michael Godfrey, assistant principal and athletic supervisor, gave an overview of the NPHS athletic department in the gym, showing a list of the different seasonal sports teams on campus and explaining the tryouts process and student athlete requirements. He also mentioned the new athletic facilities such as a new swimming pool that was finished in 2018 and the new softball field complex and sand volleyball courts which will be revealed in 2019. Jorge Soto, department chair of mathematics, also went over the math courses that are provided at NPHS. There is a CP pathway and an honors pathway. Soto recommended two math courses that he thinks every student should take: financial algebra and statistics. NPHS also provides Algebra 1 Honors for students who haven’t yet taken the course in eighth grade. Students were also able to learn more about the International Baccalaureate (IB) program. Debbie Dogancay, IB coordinator, first gave an introduction about the goals and mission statement of the IB program. IB helps prepare students to be independent thinkers and life-long learners. The program focuses on critical thinking and teaches many useful skills such as research and writing. 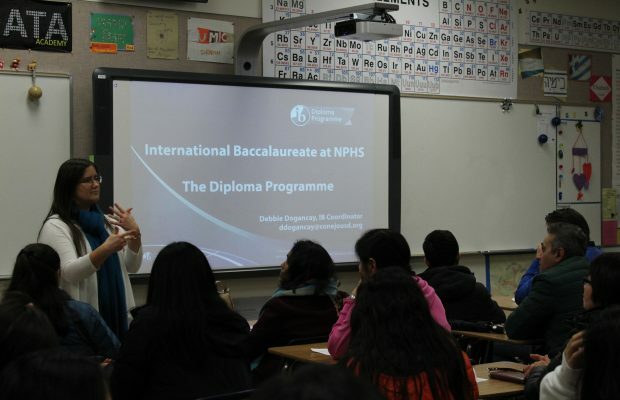 NPHS has been an IB World School for over 20 years. Currently one-third of the NP teachers are IB trained and 400 juniors and seniors are taking one or more IB classes. The best way to prepare for the IB program in junior and senior year are the honors classes. However, college-prep based students can also take advantage of the IB program.